A relaxing visit to the local hot springs in the uplands of La Fortuna is a must, and Kalambu Hot Springs Water Park offers the chance not only to sit and soak, but also to have some wet and wild fun. 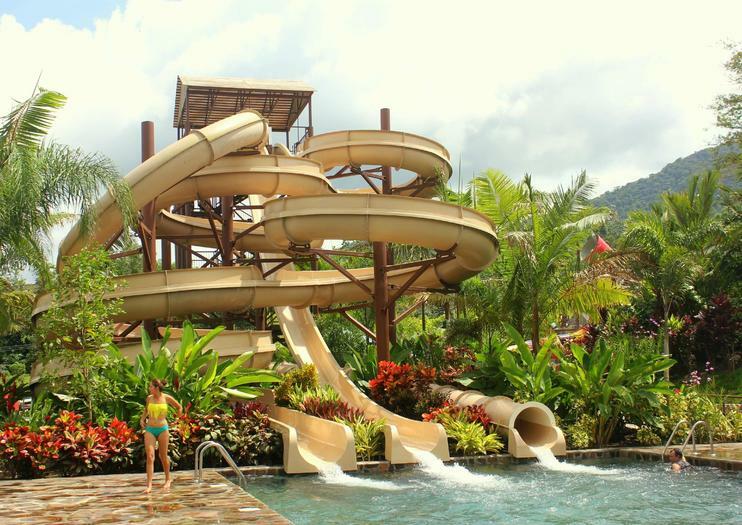 Visitors can relax in thermally heated pools near the base of the Arenal Volcano, while enjoying the thrills you’d expect at a modern waterpark. Attractions at Kalambu Hot Springs Water Park include the Mammoth, a four-story tower where visitors sit in a wide, circular raft and shoot nearly 400 feet (122 meters) down a winding, twisting slide, and the Triple Slide lets you race your friends to see who splashes down first. There’s also an interactive play area for children, featuring a giant bucket that dumps water over unsuspecting visitors. Day passes and white-water rafting combination tours are available. Lockers and towels are available for rent. There is a restaurant on-site; no outside food is allowed. Many of the waterslides have a minimum age of 6, and children under 6 years old must be accompanied by an adult in the play area. Kalambu Hot Springs is a 5-minute drive from La Fortuna and a 3-hour drive from San José. Some tour companies offer round-trip transportation to the park. Most tourists prefer renting a car to get around Arenal and La Fortuna. Local buses leave from the La Fortuna bus station (one block south of the central park) to the area around Lake Arenal where the water park is located, but this is not the most convenient option. To avoid crowds and perhaps save some money, visit the park in the evening when discounted prices may be offered. But keep in mind that it may get chilly once the sun sets, depending on the time of year. Also, Costa Rican residents receive a discounted rate, so expect bigger crowds on the weekend when locals tend to visit. Built on the edge of the Arenal Volcano, nearby Arenal Observatory Lodge boasts 800 acres of rain forest, gardens, and farms with more than 7 miles (11 kilometers) of trails. The property offers several guided treks, including special tours for birders, along with other activities such as hiking, horseback riding, and mountain biking trails. Spend a day sliding, splashing, and soaking with admission to Kalambu Hot Springs Water Park in the heart of the Arenal region. This admission ticket includes access to all of the water park’s attractions, including thermal pools, an interactive play area, and waterslides, along with parking, lockers, and towels.